Marvel Entertainment debuted our first look at New York Comic-Con back in October and now much of the cast of everyone’s favorite band of misfits has been revealed. The Guardians of the Galaxy previously appeared in an episode of both “Avengers Assemble” and “Ultimate Spider-Man,” and much of the principal cast will be returning including: David Sobolov as Drax the Destroyer, Kevin Michael Richardson as Groot, and Trevor Devall as Rocket Raccoon. The newcomer to the cast is “Boy Meets World” star Will Friedle as Peter Quill, AKA Star-Lord, who has no shortage of experience with superhero cartoons having provided the voice of Terry McGinnis on “Batman Beyond” and Deadpool on “Ultimate Spider-Man.” The role of Gamora has yet to be revealed, but check back here for an update as soon as we learn it. 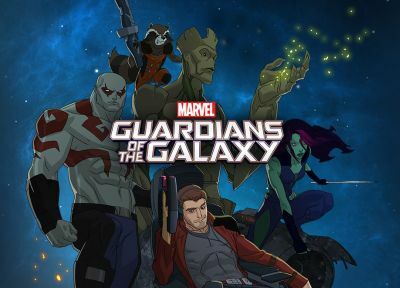 Produced by Marvel Television, the series stars Peter Quill as Star-Lord, the brash adventurer who, to save the universe from its greatest threats, joins forces with a quartet of disparate misfits – fan-favorite Rocket Raccoon, a tree-like humanoid named Groot, the enigmatic, expert fighter Gamora and the rough-edged warrior Drax the Destroyer. The series will premiere in 2015 on the Marvel Universe programming block on Disney XD. You can check out the cast introducing themselves and their voices for the characters in the videos below.